If you are driving in the state of Texas and are under the age of 21, an officer who pulls you over and even so much as smells alcohol on your breath can charge you with underage DUI. Because it is against the law to drink under the age of 21, the state of Texas has zero tolerance for underage drinking and driving. Texas laws state that any minor who has “any detectable amount of alcohol in his/her system” while driving a motor vehicle can be charged with DUI. If this happens to you, it is important that you take it seriously, as this charge can have long-lasting and serious effects on your life. The National Highway Systems Designation Act of 1995 mandated that all states set the limit at 0.02% blood alcohol concentration (BAC) levels for drivers under the age of 21 in order to receive Federal Aid Highway Funds. Some states decided to go even further and set the limit at 0.00%. However, Texas kept the 0.02% limit, which means that if you were charged in Texas with an underage DUI based on a 0.00% standard rather than 0.02%, it was not in line with state laws. If this is the case, you will need a good DUI attorney in Houston to fight these false charges for you. 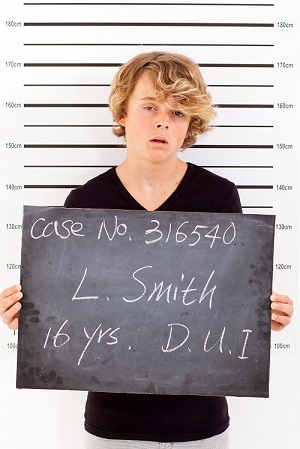 Underage DUI in Texas is considered a Class C misdemeanor. While the arrest of a minor for this crime is similar to that of an adult, sentencing for a minor charged can be much different than for an adult. Its important to understand these differences and realize how crucial it is to hire an effective DUI attorney in Houston that has a great track record in DUI cases. The penalties for an Underage DUI in Texas are slightly different than those for an adult. A driver under 21 years of age is legally considered a minor, which means you will not receive jail time and the penalties will not be as severe as those for an adult. However, the consequences are still severe and long-lasting. If convicted, the offense will remain on your record permanently, affecting your life for years to come, including the ability to acquire higher education, gainful employment, and professional licensing. Keep in mind that other possible contributing factors, such as high BAC levels or injuries due to your actions, may affect what penalties you receive. In addition to these penalties, you will be responsible to pay any fines, court costs, probation fees, and legal fees that are associated with your hearings and consequences. Unfortunately, officers do make mistakes and sometimes file false charges. Sometimes the instruments that measure BAC fail and false readings are submitted. You certainly dont want to get a charge on your permanent record that you dont deserve. We at Scheiner Law Group can review your case and fight to keep your record clean, as well as restore your life to normal after a false underage DUI charge has been made against you. If your charges are not the result of a false accusation or nonworking equipment, we still believe that you deserve a second chance. In some cases, young people who are otherwise upstanding citizens use bad judgment and get behind the wheel of a vehicle after a sip or two of an alcoholic beverage. Regardless of your situation, we will fight for you. Because a charge if Driving Under the Influence can become a permanent part of your record and can have long-term negative effects on your life, the attorneys at Scheiner Law would like the opportunity to defend you against all underage DUI charges and help you avoid the many negative consequences that may affect your otherwise bright future. No matter the situation, you will want to have a competent Houston DUI lawyer going to bat for you. Give us a call today so we can begin our job of defending you and your future!